At some time during the working life of your uninterruptible power supply it will be time to fit replacement UPS batteries. This will depend upon the design life of the batteries fitted and several other factors. Most uninterruptible power supplies are installed with five-year design life sealed lead acid (SLA), maintenance-free batteries. The design life is a target and the actual working life is a function of the ambient temperature the batteries are operated within, the number of charge/discharge cycles they are exposed to and charging regime of the UPS itself. It is important to remember that batteries store electrical energy as a result of a chemical process and there are several factors that can affect battery performance and working life. The ideal operating temperature range of an SLA battery is 20-25 degrees Centigrade. As temperature rises, the back-up (runtime) provided would increase but the design life will be affected. For every one degree rise above 30 degrees the design life will reduce by 50%. With a five-year design life battery we would typically expect to see replacement around years 3-4. For a 10-year design life battery we would see replacement UPS batteries being fitted around years 7-8. The simplest test of a battery set, is to turn-off the AC power and see if the UPS supports a load. This may seem crude but for smaller, less critical UPS systems it can negate the need for a testing service and additional hardware. The load does not have to be critical provided that it is representative of the power (kVA/kW/Power Factor) of the actual load. Most UPS systems do however incorporate some form of battery testing, and the larger the UPS the more sophisticated the built-in monitoring and testing. Automatic tests will normally be set for every 24-hours and the UPS will use its own inverter system to place a short-term load on the battery set. The test is a momentary indicator as to the overall health of the battery string. Any drop in the measured DC voltage below a stored algorithm will generate an alarm. This test is normally carried out whilst the UPS is also supporting the load. A manual test function is normally also available. Alternative and more thorough tests include load banks, hand-held testers and battery monitoring systems. Load banks can be hired and fitted for critical power testing of a UPS and its battery set. The tests normally involve the UPS being taken out of circuit to the load, and the load bank (normally a resistive load) connected in place using temporary cables. This method again just tests the entire battery set. Hand-held battery testers allow each individual battery cell to be manually tested and checked. The hand-held tester is connected through leads to the battery terminals and measurements taken. The tester may use impedance testing and/or chemical analysis that compares results to a known norm; either the battery manufacturers published data or the data recorded as a baseline from a new battery. The results of all the tested batteries can be uploaded to a central database (cloud based) for overall population analysis. The advantages of this method are that all the batteries can be inspected and tested to identify which cells are failing or have failed. Battery monitoring systems may also be used. These are the most expensive solution as they are fixed, in-situ systems. However, a complete battery monitoring systems does offer the benefits of 24-7 monitoring of an entire battery set. The system will provide intelligent communication and storage of battery data and this can generally be accessed via an IP-network SNMP protocol or uploaded to a cloud server for analysis. Visual inspection is also a good indicator as to the overall health of a battery block and the battery set. Buckled plastic cases are a sign of heat on discharge and indicate that the battery is near to its end of life. Any white residue around the battery terminals again indicates a failing battery, as would any other leak of the gel or electrolyte from the battery case itself. Once you have identified failed or failing battery blocks it is then important to consider the overall age of the battery set itself. Battery set or string performance drops down to that of the weakest battery block. Simply replacing individual blocks may not be cost-effective in the long-run as their performance is then reduced to that of the next weakest battery block. For this reason complete battery string and battery set replacements are the norm. When replacing batteries it is vitally important that the new battery configuration matches that to be removed in terms of the DC bus voltage (Vdc). The battery Ampere-Hour (Ah) can be different if a reduction or increase in back-up time (runtime) is required. The battery type (technology) must also be matched, with a sealed lead acid battery set being replaced by a sealed lead acid battery set. If the battery type is to be changed, the UPS firmware may require reconfiguration to set the charging regime accordingly. In terms of battery brands, it may be possible to change from one battery manufacturer to another but care should be taken. It is always advisable to check with the UPS manufacturer which battery brands they recommend for use with their systems. There may be a preference based on price or the technical characteristics of both the battery and the UPS charging regime. 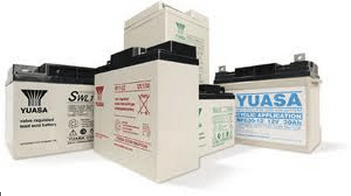 At EcoPowerSupplies we specialise as an independent UPS supplier and can recommend the right replacement batteries for your UPS system from our knowledge bank, experience and relationships with the leading UPS and battery vendors. Unless the UPS has a ‘hot-swap’ cartridge facility, most battery replacement will require the uninterruptible power supply to be put into maintenance bypass or at least taken out of circuit. This will normally be either an internal or external UPS maintenance bypass switch. ‘Hot-swap’ cartridges are common for smaller UPS systems below 10kVA. The cartridge locks are simply opened to allow it to slide out from the UPS or its battery cabinet/tray. Once out of the UPS, the cartridge case can be opened and the batteries replaced. The cartridge can then be slid back into position and locked. For UPS above 10kVA the batteries are normally configured into battery cabinets or placed on battery stands. Each battery is wired into a battery string and/or battery set through inter-cell connectors. To replace the battery blocks will require a torque set wrench and associated tools. When planning a battery replacement it is also important to consider logistics. The larger the Ah-rating of the battery, the heavier it will be. The larger the battery set, the more batteries will be required. As well as getting the new batteries into position, there must be sufficient working area for safe-working and the removal of the existing battery blocks. Most UPS battery suppliers will provide a recycling-service through their own facilities or a WEEE complaint facility. The company may offer a rebate or discount based on the materials recovered through the scrapping and recycling process. To carry batteries, they should be registered with the Environment Agency as a licensed waste carrier and provide you with a Waste Transfer Note for your own records of the batteries removed from site for recycling. Companies like EcoPowerSupplies also offer this service for legacy UPS systems that require removal from site and disposal. Finally, it is important to remember that batteries store energy; even a failed battery can contain hazardous current and voltage. Any battery replacement and handling must be carried out by technically competent and certified engineers.